Tandem Storytelling & Workshop coming right up! This is a reminder to book your spot for stories (2-3pm) and workshop (3-4pm) on Saturday, July 30. Diane Macklin and Arianna Ross will follow their stories with separate workshops for children and adults. There has already been keen interest in the adult workshop intended for teachers, parents, and librarians on using the medium of storytelling to support learning. Be sure to reserve your spot by calling 301-891-7259. Saturday Morning: Because the electricity was out until a few minutes ago, our set-up of the library was delayed and opening will be at 10:30, not 10:00. 7/18 Update. Thank you. Someone saw this post and contacted the family. They will be picking up the book today. The library staff is searching for Cassy and Nessa, probably sisters. Please ask them to call us at 301.891.7259 and ask for the reference librarian. The book their Zayda wrote for them, Story of a Happy Hippo and a Rhino, was accidentally turned in at the library, inside another book. Interested in other grandparent terms? Come into the library this afternoon for the kids' safety campaign. Children get free fire hats and coloring books. Adults get free batteries for their smoke alarms etc. etc. etc. Sponsored by the Takoma Park Volunteer Fire Department and Montgomery County Safe Kids. Be sure to take and use the special occupant documents that need to be affixed to your refrigerator. Rescue personnel really do look for those files. This will be repeated the second Saturday afternoons of August, September and October. Two great storytellers in one program... with a bonus second hour for both adults and children! Arianna Ross and Diane Macklin, two of the Takoma Park Maryland Library's favorite storytellers, are joining forces to tell stories from 2 to 3 pm on Saturday afternoon, July 30. The second hour, one of the women will work with children on storytelling skills while the other will meet with adults to discuss how storytelling can be used to support curriculum, homework, and learning in general. For the workshops between 3 and 4 pm, we will need to know who is attending, so please sign up. (Call 301-891-7259). Thanks to the Washington Redskins and the Friends of the Takoma Park Maryland Library who are underwriting the cost of this program. One of our favorite readers died last evening. 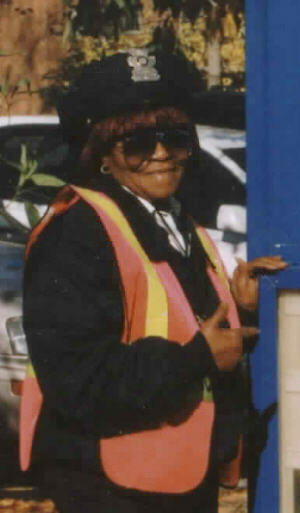 Annie was a school crossing guard, in recent years usually posted at the intersection of Holly and Philadelphia. Almost every day she came into the library and sat and read - and read - and read. In her uniform and usually at one of the most visible tables. Very few working adults set aside time to come into the library almost every day to read. Yes, many adults read in front of their own children at home so that those children will grow up believing that good adults read. Reading to yourself, silently, for your own pleasure, where children can see you is very, very important in creating readers. But whose reading was an example to all the other children? Annie. Annie was our own celebrity ALA-Read poster. Today is the centennial anniversary of the Forest Service - founded July 1st, 1905 during the days of Theodore Roosevelt. You can celebrate by coming down to the Folklife Festival on the Mall this weekend to visit the Forest Service pavilions. Sing along with the Fiddlin' Foresters (who are usually playing in Bozeman or Durango), discuss your bee problems with entomologists and tree rings with plant pathologists, watch wood carvers and smoke jumpers, eat fry bread and smoked fish, listen to logger poetry. Schedule. G. W. Chapman is there and you can pick up an autographed fan. He is the man who climbed a tree to rescue a subsequently famous bear cub, Smokey. Or you could go visit a forest. In Western Maryland they now have bear crossing signs along I-68. Can't do without air conditioning? The library has a subscription to American Forests, which has lovely pictures and short articles. You could check out a batch and thumb through them at home while you pretend you are at the folk festival by listening to good music you downloaded from Smithsonian Global Sound. A few free downloads are available through July 31st. Monday, the 4th of July, Takoma Park will celebrate with its 116th annual party. The parade begins at 10 on Carroll Avenue and follows the usual route. The evening festivities start at 7:30, fireworks around 9:30 The rain date for the fireworks is the first clear night. For all the details check the Independence Day Committee web site. Remember to buy raffle tickets. If you attend you should help this small committee pay for the event. Statistics for the lovers of numbers. An American Revolution booklist for kids, created by the American Library Association. You are just 6.49 miles, a 21 minute subway ride away from the original Declaration of Independence. Take the red line to Gallery Place, then the yellow to Archives. On that very same 4th of July, 1828 the President (J. Q. Adams) dug the first shovelful for the C&O canal. 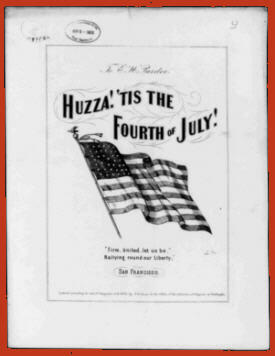 The sheet music image is from the Library of Congress' American Memory collection.